Kofi Annan was a man I trusted. Why? Because he cared. The Kofi I knew was authentic. There walk among us those who carry a magnetism of our shared humanity and radiate that positive energy with humility and a softness that engenders Trust. Kofi Annan was such a person. He carried that Madiba Magic effortlessly. Selflessly. Touching the lives of millions. I trusted him. I admired him. I saw in him a “servant leader”. It is a trait so lacking in global political leaders today. I remember his wise words exchanged with him on the occasion of the Mandela Centenary Celebrations in Johannesburg, just a month ago. We shared our hopes and aspirations for the future of SA, Africa and the world. The turbulence we felt is growing. Chaos, war, conflict, violence against innocent women and children is exploding. We discussed the volatile, uncertain world we leave to young people. They face an ecological emergency, growing inequality and exclusion. They feel betrayed by those in power. Those of our generation. In business, politics and even civic society. Everywhere. We committed to work together to build those pathways of Hope and Opportunity for young people, especially in Africa. Our young talent should not be fleeing the continent looking for brighter futures outside. We have the wealth of the global resources on our continent. We have the youngest demographic profile that could power the global economy. If we only had leaders who served our people. Leaders who had the political will to do the right thing. To make choices that put the lives of our people at the centre, not the personal self-interests or that of their families and friends. His reflections on this were pertinent to these troubled times. And it was a question which we should all ask ourselves: Who am I? What is the purpose of my life? I believe Kofi Annan knew who he was. He understood his purpose. He was not a pretender. Neither was he a saint. He was a man, a leader who recognised his frailty. His mistakes. On the 10th anniversary of the Rwandan genocide, Annan acknowledged his shortcomings. “I myself, as head of the UN’s peacekeeping department at the time, pressed dozens of countries for troops,” he said in 2004. How many world leaders display such honesty? “Annan, the second African to lead the United Nations, was 80 years old when he passed away peacefully on Saturday after a short illness,” the Kofi Annan Foundation said. 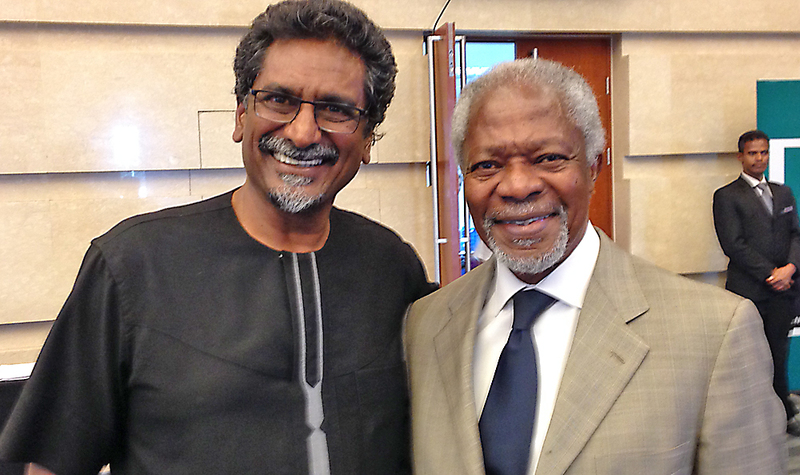 Annan served two terms as UN chief from 1997 to 2006, and was awarded a Nobel Peace Prize in 2001 for his humanitarian work. He solidly embraced the sacred feminine. He never hesitated to plead for unity. Kofi Annan remains “a global statesman and a deeply committed internationalist who fought throughout his life for a fairer and more peaceful world. Wherever there was suffering or need, he reached out and touched many people with his deep compassion and empathy,” his foundation said. Unafraid to speak truth to power, he argued that “ignorance and prejudice are the handmaidens of propaganda”. “Our mission, therefore, is to confront ignorance with knowledge, bigotry with tolerance, and isolation with the outstretched hand of generosity. Racism can, will, and must be defeated,” Annan said. His life philosophy reflected these ideals.